News that "Rockin' In the Free World" will be re-issued as a single and a new music video this summer. 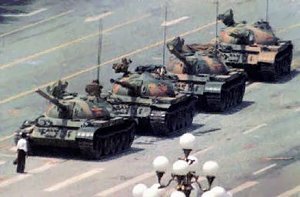 And -- standby -- the video will be directed by Michael Moore. Details are still sketchy, but Big News Network reports a July/August release of the new video. No word on version to be used. Or the fact that if Neil is no longer signed to Reprise Records how this arrangement will work. "Today there's a lot of images that go with the music. A lot of music is crap and it's all commercial and the images are all trying to sell the record or somebody's image. And that's all cool, that's what they do. But that's not what we were doing. And that's not what I'm interested in trying to do. I just wanted to tell a story and create a point of view and put across a feeling with some music and use the video that way. So I think if people are going to use the media that way to get a message across and try to get something going, it's not going to be like it was in the sixties, because that was more like one of the first times that the power of music was so obviously used by a generation to bind them together and their aims and goals. I think now it's a multimedia thing: it'll never be as focused on the music as it was." 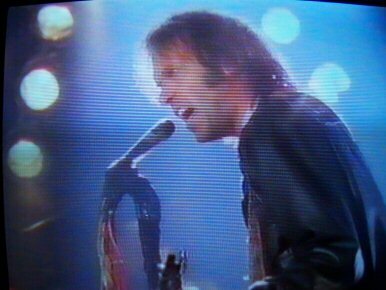 More on the original music video of Neil Young's "Rockin' in the Free World" and analysis of the meaning behind the song. In a poolside chat prior to the premeire of F9/11 at the Los Angeles Film Festival (where he is "Artist in Residence") last week, Young said that he is no longer signed to Reprise records, according to Mike 909 on Bad News Beat. It is quite unclear where this leaves him regarding future arrangements. Will he use his Vapor records label going forward? Also, Neil indicated that he will focus more on filmaking in the future. If the Greendale film is any indication of where he goes from here it looks to be interesting -- as usual. Apparently, Fahrenheit 9/11 is the temperature at which Neil Young fans begin to flame one another. This seems to be another historic time for Neil's fan base. Driving followers from the flock and acquiring new fans to his music. Over on RUST@Yahoo!, opinions are flying in a spirited and healthy debate on the importance of art, commerce and politics. "You guys make me sick, not for your stupidity, blindness or lack of historical and/or current event factual information and interpretation, but for your utter disdain for anyone who may think differently from you - isn't this what we're all supposed to be rebelling against by our love of great music? You people are so 'broad-minded' but yet cannot understand how a 'right- winger' can fathom listening to Neil's music. Dude, this is a guy that wrote a song about mashed potatoes." Neil's music and politics have veered all over the map from "Ohio", "On The Beach"/"Ambulance Blues" (anti-Nixon), "Campaigner" (pro-Nixon), "Hawks & Doves" (pro-Reagan), "Rockin'" (anti-Bush #41), "Let's Roll" (pro-Bush #43), to Greendale (anti-Bush #43). And he'll continue to swerve, certainly, across the highway, into the ditch and back... at least a few more times. "To paraphrase another great iconoclastic American artist, Walt Whitman: Does he contradict himself? Very well, he contradicts himself, for he is large, he contains multitudes." 'It's still hard to believe I had to write this song. It's ironic that I capitalized on the death of these American students." In the interest of migrating the debate, a new discussion list group has been established on Yahoo! at F911andNeil. Last we checked the poll on the use of the song "Rockin'" in Fahrenheit 9/11, about 64% thought it was a good idea for Young & Moore's music & film. About 30% thought this was a bad idea politically for Neil. And about 6% don't care about politics and music. So Stand & Be Counted! Also, see an analysis of the lyrics of Neil's "Rockin' in the Free World". "You might admire the nerve it took Jeff Tweedy to play the numbingly long electric guitar solo on the album opener, 'At Least That's What You Said,' reaching for the wearying effect that Neil Young achieved in live jams with his band Crazy Horse. Or you might wonder what kind of lunatic would plop such an inhospitable welcome mat at the front of an album, one that all but dares listeners to go knock on someone else's door. " 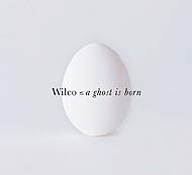 More Wilco reviews with Neil references on Thrashers Blog. 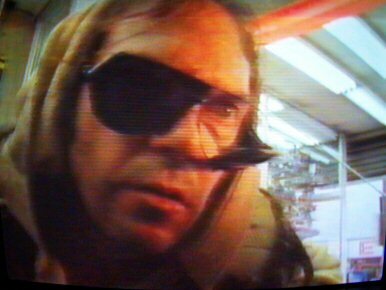 "From an opening pre-credit sequence in which Moore makes the case that Bush and his Florida governor brother hijacked the last U.S. election - remember the hanging chads? - to the closing with Neil Young on the soundtrack blaring Rockin' in the Free World ('There's a lot of people sayin' we'd be better off dead. Don't feel like Satan but I am to them.') this is scathing, deliciously nasty filmmaking. " 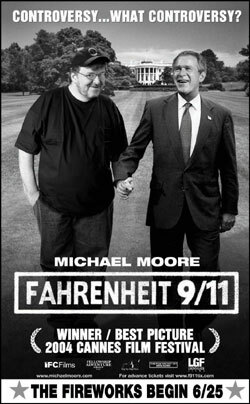 'Fahrenheit 9/11' Film Using "Rockin' In The Free World"
Filmmaker Michael Moore and Neil Young have apparently reached agreement to use Young's song 'Rockin' in the Free World' for the controversial film 'Fahrenheit 9/11''s closing credits, according to Daily Variety. About one minute of the song was edited out of the track for use in the film. Also, Young, who is serving as "Artist in Residence" for the Los Angeles Film Festival (running June 17-26), has selected the Cannes Palme d'Or winning documentary on terror, war in Iraq, and President George Bush for screening at the festival. The use of the song "Rockin'" will undoubtably put Young and his music in the political spotlight. So what do you think? Is the use of the song in the film a good idea? Or is this going to create nothing but trouble for Neil? 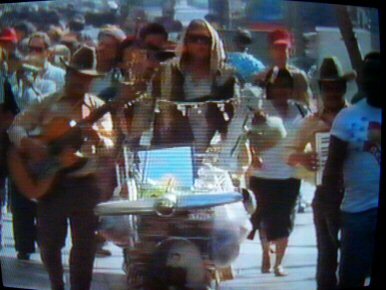 Please comment and add your thoughts on Moore's use of "Rockin' In The Free World" in the film 'Fahrenheit 9/11'. For more, see an analysis of "Rockin' in the Free World" lyrics which is Thrasher's Wheat Page of the Moment. So there you have it. Check out the other Neil polls, get off that couch, turn off that MTV and VOTE! 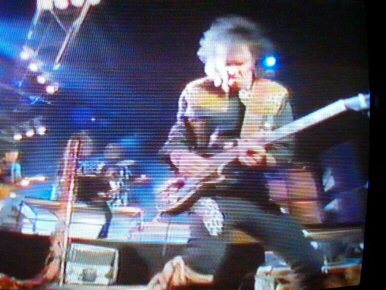 Which song did Bruce Springsteen and Neil Young perform together in Australia in 1985? What is the connection between Jimi Hendrix and Neil Young? Can Neil really out jam Led Zeppelin's Jimmy Page? 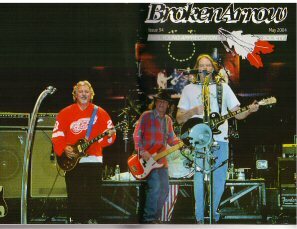 Who called Crosby Stills Nash & Young 'America's Beatles'?" Get the facts on the FAQ. "In an era lacking visible politically active artists and a culture saturated with choices of a few corporations, Young brings a touch of green to an otherwise concrete-grey landscape. "Greendale" isn't polished, but it stands alone as a fictitious story full of realism -- the reality that has been forgotten. Your ears might just nod in agreement." More on the Greendale film, inside the "Making of", and movie reviews. Caught the Wilco concert at the 9:30 Club in Washington, DC on Wednesday and it was most awesome. If you missed the webcast, here's a review with a photo and setlist. Broken Arrow Magazine's May 2004 (#94) issue just arrived at the Thrasher household so it's been time to log off and curl up with a good read. As usual, the Neil Young Appreciation Society has produced an excellent summary of the last leg of the Greendale World Tour. Lots of super photos and articles, including an exclusive with Mountainette backup singer Nancy Hall. Interviewed by Robert Clark Young, Nancy answers all sorts of innaresting questions about touring with Neil. Also, an item on the recent Ebay auction for the "Holy Grail" of Neil collecting -- a 45rpm of The Squires "Sultan/Aurora" -- going to a high bid for $1,825. And a nice remembrance of Carrie Snodgress and her life. A great cover shot from Camden and lots more from Radio City Music Hall, New York by Rusted Sister and Ed Gendelman. More on N. Y. A. S. and another fine job Scott!!! Thanks. 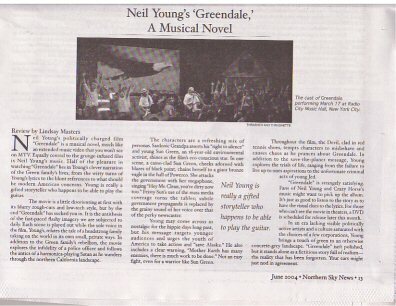 Neil Young's Greendale film was voted "Best Feature" at the 3rd Annual Santa Cruz Film Festival according to the Santa Cruz Sentinel. It has been 10 years since Nirvana's Kurt Cobain passed away. 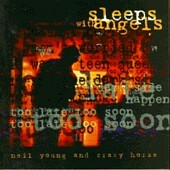 Cobain's suicide note quoted Neil Young's song "My My, Hey Hey" lyrics "It's Better to burn out, than to fade away" which had a profound impact on Young, who recorded portions of the 1994 'Sleeps With Angels' album in Cobain's memory. 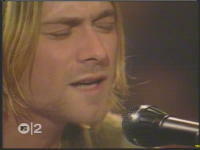 Check out Thrasher's Wheat's latest Neil Page of the Moment on Kurt Cobain who "Sleeps With Angels". 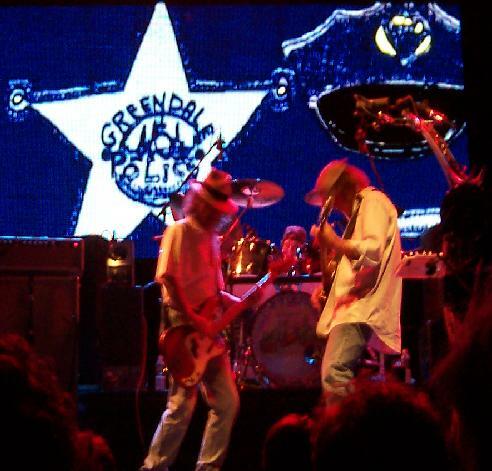 See news for May 2004 for more information on Neil Young's Greendale, photos and reviews.